Louisbourg, Nova Scotia | Turning my world upside down! 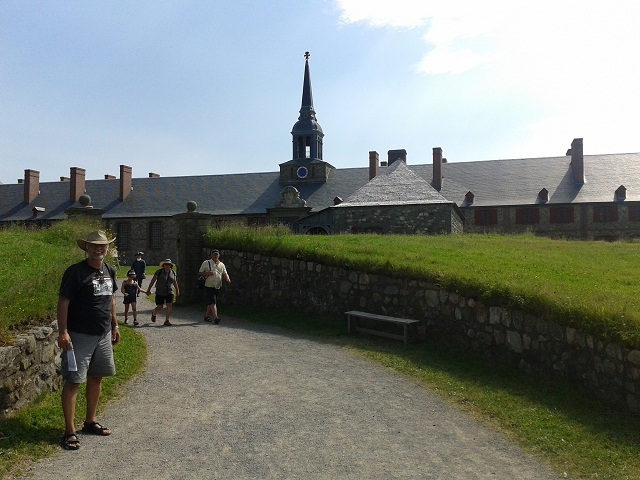 In 1713, 300 yrs ago, the French established the largest fortress in North America in Louisbourg. It was attacked by the New Englanders and finally by the British, and abandoned in 1758. It was meant to be the capital of Ile Royale (Cape Breton Island) and Ile St-Jean (Prince Edward Island). 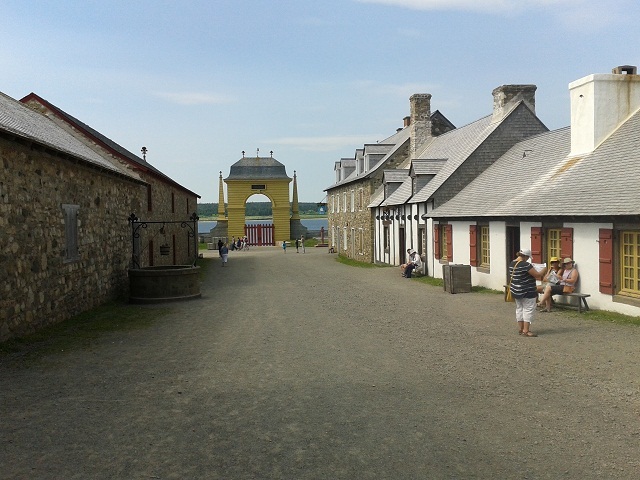 The fortress ruins were declared a National Historic Site in the late 1800s and by the 1960s, the local politicians agreed to rebuild the fortress to help create work for the Cape Bretoners following the closing of the local mines. This economic stimulation may not have had long reaching effects, but the reconstructed fortress is spectacular in its details. 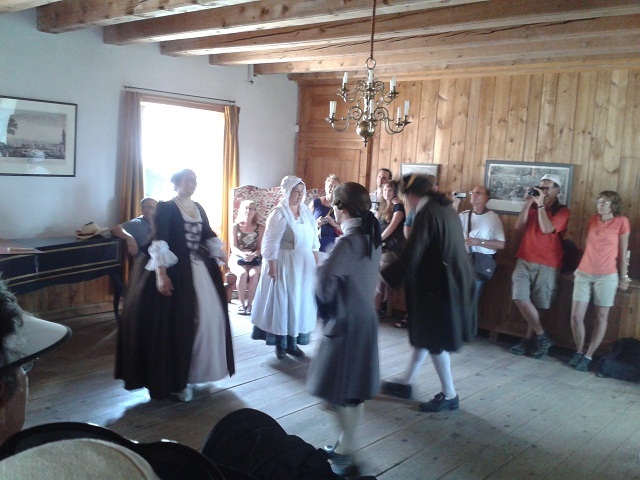 It’s like stepping into the 18th century, where local soldiers, merchants and craftsmen speak to you about their life. 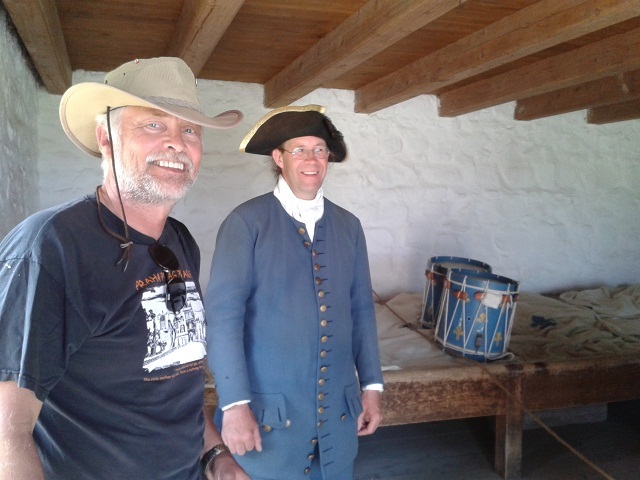 Living history! 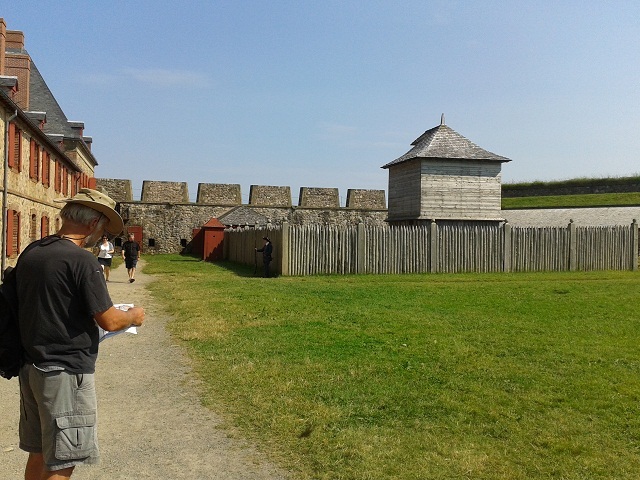 It is also noteworthy to mention that only ¼ of the fort has been reconstructed. The size of the original settlement was impressive. Leon and I arrived rather late in the afternoon on Sunday as Bruce, our GPS, kept taking us down side roads. I know we like scenic routes, but we were a bit low on gas, so this was not the time. Besides, I think some of those routes have not been paved since the French gave up the fort! At any rate, we visited the fortress for 2 hours and returned this morning to see some of the exhibits and areas we had missed. Last night, we stayed in town, right on the harbour, between 2 fish processing plants. Boy, the smell was horrible, except when the wind shifted for a while. Thank goodness the campground was clean and the showers were hot! 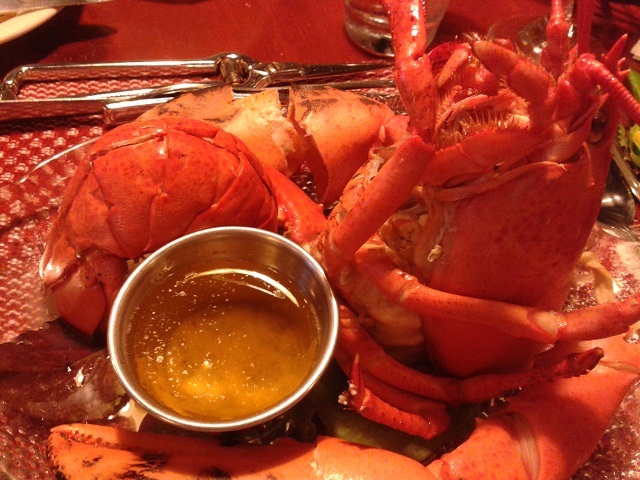 The best part of the evening was the incredible boiled lobsters we ate. Omm, nommm!! 24 hours later, I am still too full. We are currently on the ferry to Newfoundland. It’s meant to take about 5 hours to Port Aux Basques from North Sydney. We’ve had time for a nap, some reading and a very mediocre dinner. 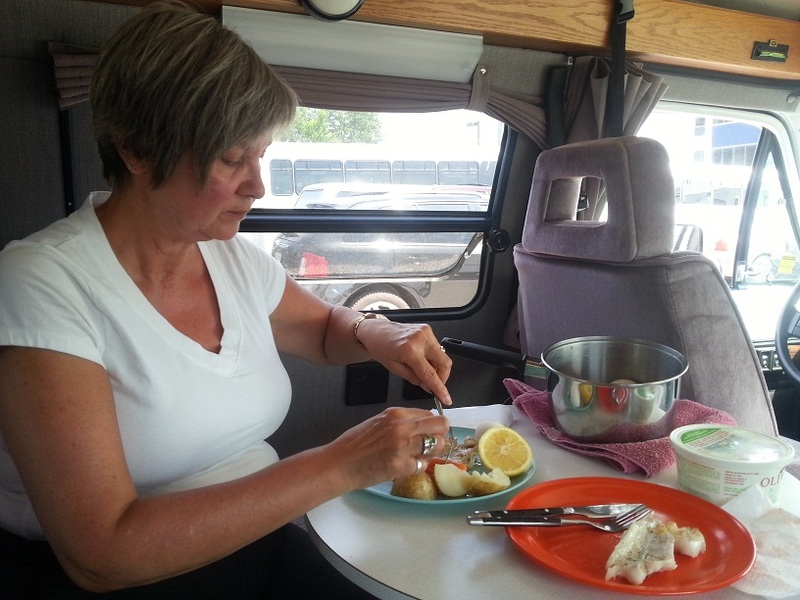 The lunch I made in the camper, haddock, eggs, potatoes and carrots, was much tastier. At least we got to see some dolphin pods from our dining room seat. Hi Catherine, The fort looks like a magnificent piece of history! I noticed you mentioned a North Sydney, does that mean their is a Sydney??? (as in our Sydney, N.S.W.) I know it’s not necessarily the case as I lived in a place in Gippsland, Victoria called Mirboo North but their was no Mirboo!!! You and Leon certainly have the life, travelling around. Is it your major break from school or have you ‘retired’? Hi Sue. No we have 2 Sydneys here, one on each coast. People can easily end up in Sydney, NS rather than Australia if they are not careful! This is our summer holiday, 8 weeks. Retirement is only in 3 more years. Yes, we love this lifestyle.